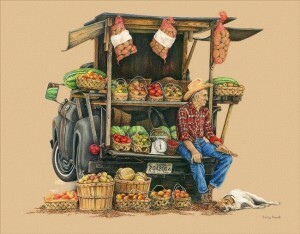 It’s going to be another beautiful day for the market this Saturday… stop by for more sweet corn, green beans and home grown tomatoes… a few heirlooms and just plain ole red ones. It’s been really dry for the past few weeks and the gardens are beginning to see the effects, Kenny is hoping to keep the veggies coming but it’s not looking good. We have been irrigating, but that just may not be enough. Winter squashes are ready, we will have butternut, acorn and spaghetti this week and buttercups in a few more weeks. Apples are ready, we will have Jonagold, Golden Delicious and Mutzu this week. We will have more of our homemade goodies; pickles, jams, etc… along with Kenny’s Grilling Planks and my homemade Blackening Spice.